Then we'll say: ol' Pope is dead. The movie V for Vendetta introduced a new item to the radical’s toolbox — the Guy Fawkes mask. 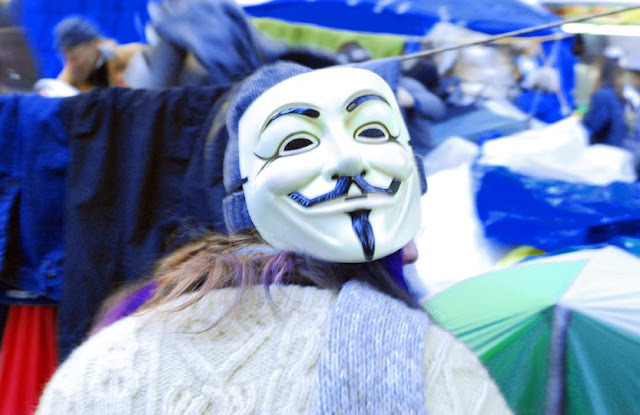 Co-opted by Anonymous it has appeared at protests ranging from Occupy Wall Street to Scientology. On November 5, 1605 Guy Fawkes was arrested via an anonymous tip while guarding an explosives cache underneath London’s House of Lords. This event to restore a Catholic king to the English throne was known forever more as the Gunpowder Plot. November 5 thereafter became known as Guy Fawkes Day. This traditional British poem was written in the 17th century.